THE MARTINI CHRONICLES: Building a Business Casual Wardrobe...The Basics! 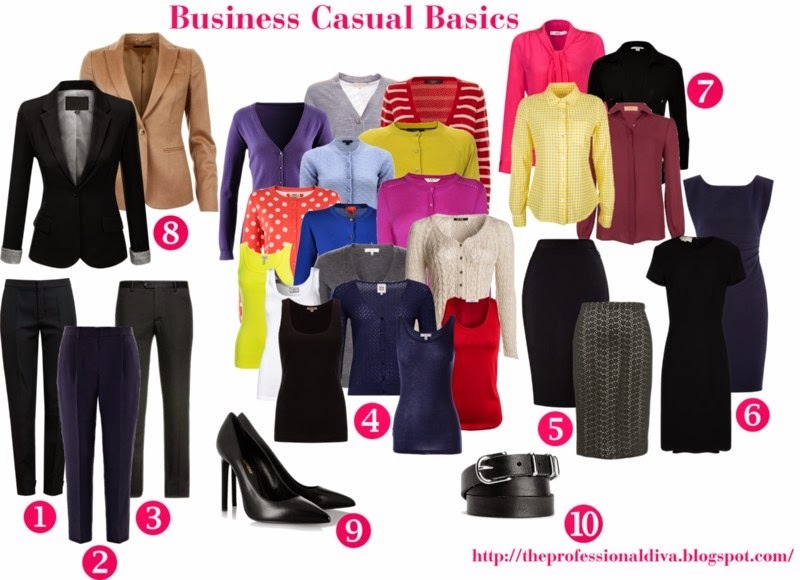 Building a Business Casual Wardrobe...The Basics! Greetings Divas! And welcome to June 2014! Over the past few months, I have had the opportunity to speak to a variety of different women at different stages of their professional lives. While these women vary in age, profession, and experience, there was one concern I noticed that each of these women had in common: their wardrobe! For the new professionals, there are concerns as to how they should dress for an interview, which items of clothing they should purchase immediately when they start a new job, and how they should dress during different work-related social outings. For the professionals that have been working in their professions for a few years, one of their concerns was how to elevate their current wardrobe and accessories. In having these conversations, I realized that there are many corporations that are moving towards a business casual work-wear model. But what does that mean? In speaking with these women, I also realized that different folks have different definitions of the term "business casual." As a result, there are several schools of thought as to which items of clothing are appropriate in a business casual work environment. Now I'm no expert, but I do have an opinion...you all knew that already! In speaking with the new professionals, I highlighted 10 basic items that they should start with when building a business casual wardrobe....and here they are! 1. Black Dress Pants - Nothing is more basic than a pair of black dress pants, which is the number one staple in a business casual wardrobe. Black pants will pair well with cardigans, blouses, and blazers. Eventually you should have several pairs of black dress pants in different styles, but one pair will suffice for the new wardrobe builder! To start, choose a classic, straight legged pair that fits comfortably. Try to go for pants made of light wool material, as this is the most versatile for the different seasons. 2. Navy Dress Pants - Another great staple to add variety to your business causal wardrobe! Navy dress pants will pair well with cardigans, blouses, and blazers, just like black pants. Similarly, select a pair that fits comfortably, and that is made of light wool material. 3. Gray Dress Pants - Variety, variety, variety! Again, these pair well with other wardrobe staples. 4. Cardigans (3) and Tanks (3) - I truly believe that cardigans and tanks are a necessity in any business casual wardrobe. Paired together, they create a neat and stylish effect. And with all of the different varieties of cardigans and tanks on the market, you are sure to find some that fit your personal style. My suggestion is to start with at least 3 cardigans and 3 tanks. While I am a fan of variety, my suggestion for your first set of cardigans is to choose solid colors that pair well with your other staple items...you can add some other funky varieties later! As for the tanks, they should pair well with your cardigans. I suggest selecting 3 that would go well with any of the cardigans; this allows you to mix and match. 5. Black or Gray Dress Skirt - Whether it is a pencil cut or an A-line, be sure to select a skirt that is knee length and made of light wool material. The best type would be one that you can pair with your cardigans, blouses, and blazers. To start, pick either a black or a gray skirt. 6. Black or Navy Dress - Another great addition to any business casual wardrobe! Score yourself one in black or navy, and be sure that it fits your form without being too tight. Also be sure to select a style/cut that is ideal for your body type. I'm a big fan of sheath dresses, but A-line dresses work as well! 7. Blouses (4) - Every basic business casual wardrobe should have several blouse options. It is important to have blouses in a business casual work environment because you are not required to wear a suit, but you still need to dress neatly. Blouses are versatile, and can be worn with dress pants and skirts. I suggest starting off with 4 blouses in varying colors and styles; however, one of your blouses should be a button-down, white shirt with a collar. 8. Blazer - A blazer is a great item that can serve several purposes. Blazers can be worn with dresses, skirts, and pants, and can also accompany a cardigan if paired properly. For those who are building their business casual wardrobe, I suggest either a black or tan blazer...these would give you greater pairing options. Be sure to choose a blazer that is versatile and that fits comfortably. 9. Black Belt - A black belt will pretty much go with every outfit you concoct from this list. But it has to be a nice one. Leather is the optimal option...with black or silver hardware. No belts with bling please! 10. Black Pumps - Black pumps are the go-to shoe for the business casual wardrobe, as they often match well with basic business casual attire. You should score a pair that is high-quality and comfortable. Your pumps should be closed toe, and should have a 2 to 4 inch heel. Now that we have discussed basic items, I want you all to note the items that I did not include on this list. 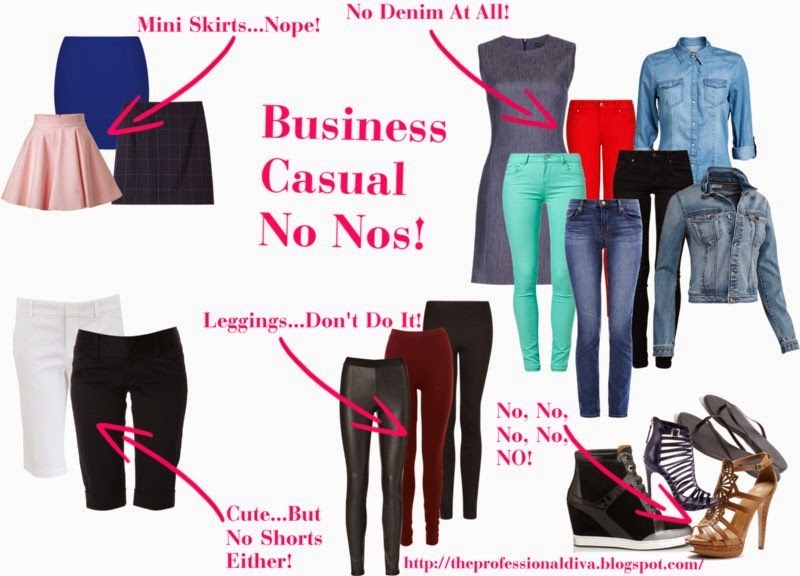 In my humble opinion, business casual does not include denim, leggings, mini skirts, or shorts. These items may work in an environment where casual clothing is acceptable, but they are not appropriate in a business casual setting. In addition, you should avoid sneakers, flip flops, and strappy sandals. So there you have it! What are some of your business casual staples? What would you add to this list? Do you honestly know how much I needed this? 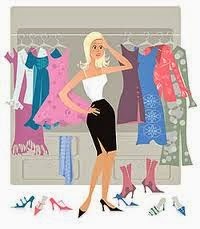 ( oh and and some money to go revamp my work wardrobe) Thanks! You rock. Thank you! I had to google "business casual" and so glad it brought me HERE! I'm so glad that I could help! Thank you for checking me out! Doing a Part 2 soon....one year later! LOL! If you fancy flats, my recommendation is to try a pair that is not too flat, but that has a slight arch. They should be on the dressier side so as to not make your business casual outfit look too casual. Leather or suede is the best fabric to achieve this look. No open toes. Michael Kors makes great flats for the office. Nine west has some great choices as well!